SUMMARY: The Super Ear SE5000 is the new upgraded version of the SE4000. With this new model, you are getting a slightly different design. 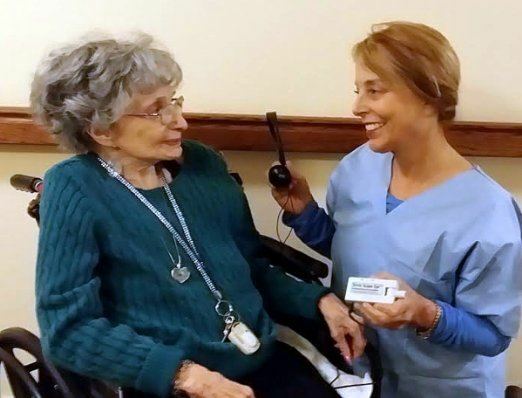 It is an inexpensive, easy to use device for individuals with mild to moderate hearing loss to use when in hospitals, nursing facilities, churches, theatres, courtroom, while watching TV and any situation where you may need a little bit of extra help hearing. The SuperEar SE5000 is the latest version of the Super Ear ( it replaces the SE4000). This new model has a more compact microphone that is much shorter than the long microphone that was on the SE4000. SuperEar has been making sound amplifiers for around 30 years and has a few different models available. The 5000 is its cheapest and most basic device. It is CMS and ADA compliant and is designed for indoor and outdoor use. It is marketed towards users in assisted living facilities or hospitals, but there is a wide range of different activities that you can use this device for, including watching TV, dining in restaurants, in a lecture or class, meetings, church, birdwatching, etc. The significant improvement with the SE 5000 over the SE 4000 is the size of the unit. The 5000 is significantly smaller and more portable and comfortable to wear. You can put it into a pocket, or it comes with a clip that you can attach to a belt or other items. It comes with two sets of earphones: the standard stereo headphones and over-the-ear bud type, so you can choose what works best for you. Realistically, the budget hearing amplifiers that are under $100 aren’t going to give you the type of sound that you get in the higher end models, (if you are looking for a device that will give you excellent sound quality I would suggest you look at the Pocketalker Ultra 2.0). If you are an individual, who isn’t too picky about sound quality and need an inexpensive device to help hear in various difficult hearing situations the Super Ear is fine. This model hasn’t fixed the issue with not picking up background sounds, (it just amplifies everything) and doesn’t use the latest noise-canceling technology. It also doesn’t let the user adjust the tone and frequency of the sound, which is a feature that helps users find the best sound that works for them. The Super Ear’s 5000 battery life is about 30 hours, which isn’t the best. If you are looking for a device where you don’t have to worry about the battery, there are better options available (the Pocketalker Ultra 2.0 has a battery life of 105 hours of use with 2 AAA batteries, although you pay more upfront for the device). One thing that I don’t love about the SE5000 is that is doesn’t have an automatic shut-off, so if you are looking for a device for an individual who forgets to turn off devices, that feature may be something to look for in another model. If you do end up going with the SE5000, consider purchasing rechargeable batteries. You can get an ambient sound gain of around 50+ decibels from Super Ear5000. This type of amplification is more than adequate for most users with only mild to moderate hearing loss. You cannot adjust the tone and frequency of the sound, so the sound you will be getting won’t be the greatest. If you are looking for a budget option to give you a bit of amplification, this device may suffice. 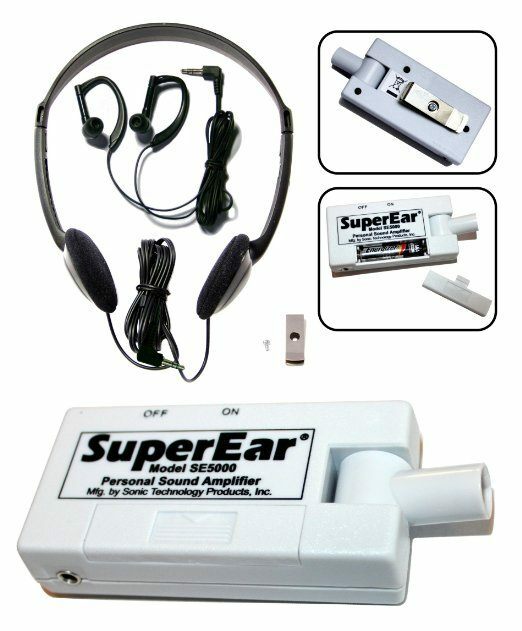 The Super Ear can be used for TV watching, conversations, while in the car, as well as hunting or birding. The company that makes the Super Ear is called Sonic Technology Products. It offers a 30 day Money Back Guarantee and a 3-year limited warranty on the SuperEar. Sonic Technology Products seem to be very responsive to questions or comments. You can talk to a customer service representative at 1-800-247-5548 Mon – Thurs 9 am -5 pm EDT, or you can also contact them through their website. Super Ear is one of the better budget options available; it amplifies sound for users in a variety of situations at a low cost. 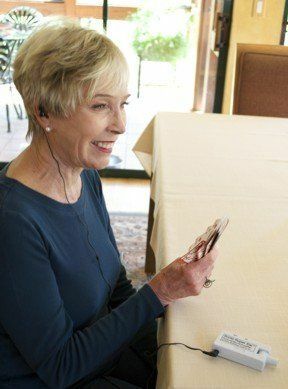 It doesn’t offer the best sound quality or cancel out background noise, but it can be helpful for watching TV, having a conversation, or communicating while in a care facility. The Super Ear SE5000 comes with a belt clip, two headphones and is available in the color white only. It is priced around $50.